In my case, it’s k3w. 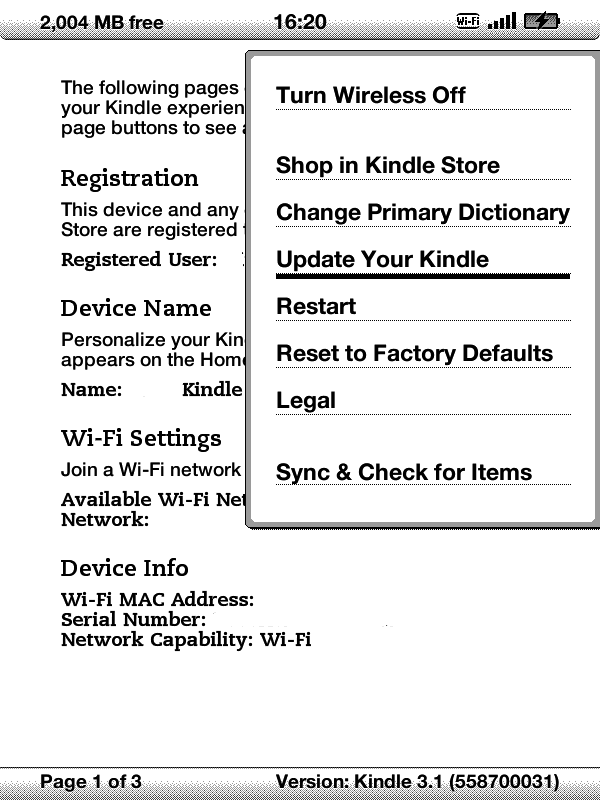 On you Kindle, go to Settings, press Menu and select Update Your Kindle. Your Kindle will then restart itself, and you’re good to go and install other tweaks or hacks the same way. *Note: On Firmware 2.x, it is expected and normal for the installation to “Fail” with error U006. Also, you SHOULD keep all ZIP files of hacks that you installed as they contain uninstall files necessary to uninstall these hacks in case you need it later on. Important note from the original thread. First of all, in most cases, there’s no need to touch the jailbreak again. You already installed it the first time you installed hacks. Just forget about it now . Next, no need to run the update_*_uninstall.bin updates, ever. (except in some specific cases, like if you’re updating the jailbreak on a 3.x device, or from another font/ss hack [in which case you should use the original uninstaller for your hacks, and not the ones found here]). Then, you can apply the latest update_*_install.bin updates, one by one. You can safely chain both hacks installs. After that, to make sure everything’s in order, do a full Restart of your Kindle ([HOME] -> [MENU] > Settings -> [MENU] > Restart), and you’ll be good to go . Note that in some cases, especially for minor updates, this restart is not strictly necessary, but better be safe than sorry . This entry was posted in How To, Jailbreak Tweaks, Kindle Devices and tagged Amazon Kindle, Custom Screensaver, Jailbreak, Kindle 3, Kindle Devices, Kindle Keyboard, Void Warranty. This has been an eye opener for me. Hi, I red your explanation (and 4 others) and followed the steps for jailbreaking a kindle 3.3 wifi+3G. It just dosent work. 0.10.N is not working on version 3.3, it always gives an error 007 or 004 and never updates succesfully. I dont know what I can do. I even tried the file for the kindle wifi, but didnt work either. Try 0.5.1 from Yifan, see if that works. A lot of people has problems with 0.10.N, it seems. Double check if you use the right file for 3G model though, as there’re two separate files for 3g international and 3g north america. And please do not try files for other models. Cheers! Hi, could you tell me what’re you trying to do? have you ever jailbreak before and install screensavers and now you want them off? or you want to jailbreak and change screensavers? And what’s the error you see when you jailbreak? what’s the version of your kindle software? Hi, it’s nor working for my kindle neither. There is an error code U004 on the left corner. I just upgraded 3.3(611680021) yesterday. Was it already jailbroken before upgrade to 3.3? hey, ive done the whole download jailbreak on it and the screensaver thing to multiple times. It doesn’t work. i wanna get the screen savers off and add my own some of them are not the nice’s pictures out there lol. the error is like U004 and U007. the kindle is 3.3. ive updated the software and tried it again. still doesnt work. wats funny is i have a friend how wanted to Jailbreak her’s so i did it for her on her computer and it went perfectly and we have the same kindle. tried to redone mine on her computer the same way and nothing. im wondering now if i’ve just tried it to many times? whose jailbreak did you use, NiLuJe or Yifan’s? have you tried both? cause the first time i did, Yifan’s failed, but NiLuJe’s worked. is it possible that it’s already jailbroken? have you tried installing screensavers hack? anything happened? ive try the screen saver hack thing n the linkss thing doesnt come up. thats really the only reason i want it jail broken to change the pictures. umm, let’s try reset it, turn wi-fi off, rename documents folder to something else (temporary), and try jailbreak again? Edited: try deregister after reset too if you can. ok well it deregistered its self wen i reset the factory settings. and ive reset it to , i dont have any documents on it so idk wat to do about that. i mean rename the “documents” folder in your kindle drive to something like “docs.bak” or anything. then turn wifi off, copy jailbreak bin file over, and jailbreak. try if that works. hey its not even letting me update it now, u think its bc i changed the documents name? yeah, can be that. change it back then. wow, this is so confusing. if this time it’s not successful, you may wanna go over and ask those geeks on the original thread, cause i really don’t know where to go from here. as you said, your friend’s worked but not yours, same model, now that sure tells something. 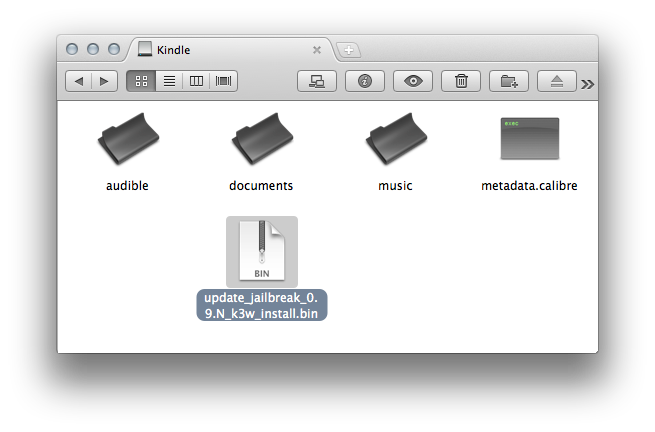 the 3.2.1 jailbreak is for 3.21 and 3.3.
ok thats it im sending my kindle to one of u guys to jailbreak it for me! lol jk jk, but where is the 0.5.1? ive probably tried it but i could always giver it another shot. Yea thanks again! doesnt seem like it ur always so good at replying back to me. Finally, decided to jailbreak, but no luck, got an u004 error. Thanks much for this. Now it’s done. First note that the abbreviations for the K3 keyboard g3 models are not the same as the ones used by NiLuJe and Yifan Lu. The both use k3g for the U.S. g3 model. Presumably, k3gb is their abbreviation for the international g3, although I can’t verify that. They don’t use plain ‘k3’ for anything. On my K3 with 3g and 3.3, the 0.10.N jailbreak didn’t work, but the 0.5.1 jailbreak did. I can confirm that by the fact that I was able afterwards to install launchpad and install and use the browser shortcut. Can anybody here say, BTW, what the ‘jailbreak’ actually modifies? Fantastic! Thank you so much, like the other poster, i was beginning to doubt my really quite extensive geekiness but 0.5.1 saved the day and I now have a “jailbroke” kindle! Ok.. I wil ltry to keep this short. I am the IT guy for a school district. We are unable to allow our students to take home our kindle 3.3’s because CIPA (childrens internet protection act) forces us to filter all internet traffic on devices we provide to our students. While on district wireless, that is no problem, but once they leave our area, we have no way to keep them in compliance. What I would be interested in is a jailbreak that would disable the WIFI radio entirely, or even better password protect the setting page so that we could disable it but the student would not be able to re-enable it. Basically, schools and parents interested in disabling the internet for their children have no options. If someone were to create a jailbreak that id this, they would be a hero. Personally, I would rather help young people get around reactionary, repressive laws like CIPA. I would certainly NOT want to do anything to help make such a law work. Not that I’m against protecting children! I do want to protect them from hunger, homelessness, parental abuse, traffic accidents, pollution, crappy supermarket food, etc. In other words, I would help protect them from real harm, not from ideas and images that might subvert their authoritarian, patriarchal, religious indoctrination. thanks much. Mine is kindle 3.3 with wifi. First using 0.10.N_k3w_install.bin, failed. But get it done using 0.5.1_k3w_instal.bin from Yifan Lu. I have a us kindle Wifi/3G with 3.3(611680021) on it and has never been jailbreak. Is it possible to jailbreak it? I have tried .0.5.1 from Yifan, and 0.10.N10. Both give code 0007. Have you ever done jailbreaking on your DX before? If yes, you could try backing up your kindle, then reset your kindle to factory default, and try 0.11.N jailbreak. Nice post. I was checking constantly this blog and I’m impressed! Extremely useful information specially the last part 🙂 I care for such info a lot. I was seeking this certain information for a long time. Thank you and best of luck. Jailbraking isn’t for removing ads, sorry. Afaik, you can’t remove them. Thank you for posting such great content. I really appreciate it.I love reading this type of content and your site definitely was not boring. Doesn’t work for Kindle 3 WiFi International (B008) either. It’s a pity.